Anyone who has left food out too long has seen the visible effects of microbial growth. The reasons for many kitchen hygiene recommendations are obvious, such as washing your dishes or refrigerating your food. But others are less so. One good rule of thumb is to remember that microbes are called microbes because they are microscopic. In other words, you can’t see germs with the naked eye, so even if you’ve wiped up that raw chicken or can’t see or smell anything wrong with Aunt Muriel’s potato salad, there’s a good chance that something nasty may still be lurking. It is easier to keep infections at a minimum by being aware of possible sources of microbial contamination, but no man or woman is an island, and you can’t always control the hygienic practices of others. The Partnership for Food Safety Education provides guidelines for prevention of food-borne illnesses. These tips are not only set in place to help prevent getting infections from foods prepared by others but also to keep you from spreading the disease to others. Use hot, soapy water to wash cutting boards, dishes, utensils, and counter tops. Soap doesn’t kill germs, but it physically dislodges them from surfaces. Hot water assists in this. Consider using disposable towels to clean kitchen surfaces, since bacteria can build up on damp, dirty cloth towels. Wash non-disposable kitchen towels often. Wash all fresh fruits and vegetables under running tap water. Fruits and vegetables come from plants that grow in soil, which is a common source of environmental microbes, such as Bacillus cereus and Clostridium. Add on manure, a common fertilizer, and you’ve got possible contamination with E. coli. This includes the washing of those fruits and vegetables with skins or rinds that are not eaten. Microbes on rinds get transferred to your hands, and then to your peeled food. Knives cutting through unwashed skins can spread microbes to the edible, fleshy parts of the produce. Keep raw meats and their juices separate from ready-to-eat foods. Most microbes can’t survive high temperatures and are killed upon heating. Raw or undercooked meats (and their juices) can be a major source of infectious disease because they provide a nutrient- and moisture-rich source for microbial growth. Use separate cutting boards for fresh produce and raw meats. Even after washing cutting boards, some microbes may lurk in cracks or crevices. It’s a good idea to keep separate cutting boards for foods that will and will not be cooked to ensure that potential microbes from the “raw meats” board get destroyed by cooking. Don’t reuse dishes that held raw meats or eggs in the course of preparing and serving a meal. 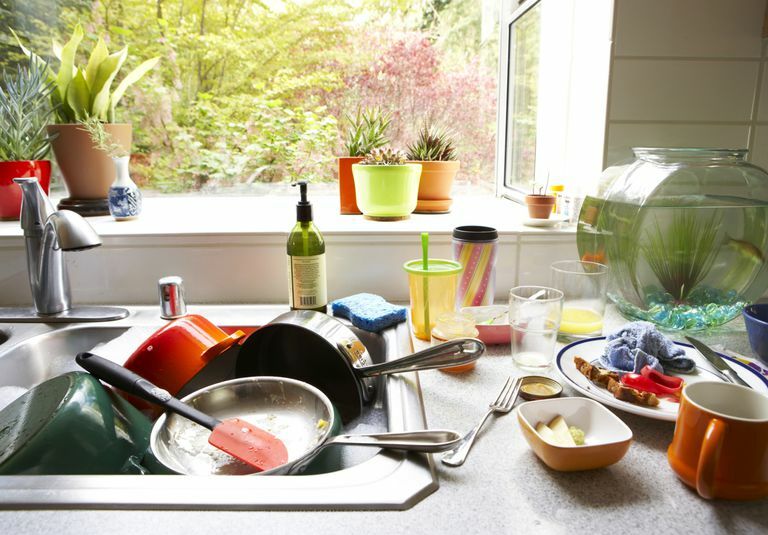 Some people like to re-use their dishes, with the idea being that the hot, cooked foods will kill any germs held in the dirty dishes (and they'll be able to keep their dishwasher load down). However, while the heat from cooked foods may kill some remaining microbes, there’s a good chance that the temperature isn’t high enough for decontamination. It’s not worth the risk. Use a food thermometer to make sure your roasts, steaks, and fish are cooked to at least 145 degrees; poultry (inner part of thigh and wing and thickest part of the breast) to 165 degrees; and ground meat to 160 degrees. These are the recommended temperatures to eliminate most microbes associated with each food type. There are a few types of infectious bacteria, such as Clostridium botulinum, which can form spores that survive these temperatures. Fortunately, the Clostridium toxins responsible for the disease are killed by adequate heating, although the spores can cause infant botulism in young babies. Reheat sauces, soups, and gravy to boiling, and other leftovers to 165 degrees. Cooking a food doesn’t mean that it is now sterile. In some cases, the few remaining microbes that survived heat are not sufficient for causing disease, but they can re-establish growth after cooking. In other cases, post-cooking contamination may occur. In either case, reheating to these recommended temperatures is important to prevent disease. Uneven cooking can lead to uneven heat-killing of microbes, so be sure to stir and rotate food when microwave cooking -- even if your food's temperature is already to your liking. Don’t use recipes that call for raw or only partially cooked eggs. Eggs can be a source of Salmonella enteritidis, which grows on the inside surface of eggshells. It is more commonly found in the egg whites, but it can sometimes penetrate into the yolk. Make sure your refrigerator is set at 40 degrees or below, and your freezer is 0 degrees or below. Refrigeration can stop the growth of most bacteria, and freezing can kill some microbes. Keep in mind that some microbes, such as Listeria, can withstand and even grow in temperatures below freezing. Meats, eggs, and other perishables should be refrigerated or frozen as promptly as possible. Most infectious microbes grow best at temperatures that are similar to the human body, but many also thrive at room temperature. The more prompt you are about refrigerating or freezing your foods, the less opportunity they have of developing larger scale contamination. Defrost food in the refrigerator, under cold water, or in the microwave. Never defrost at room temperature, where microbes can thrive. Food should be marinated in the refrigerator, where most microbial growth slows or stops. Perishable foods should be refrigerated within 2 hours of sitting at room temperature. Any longer and you run the risk of high levels of microbial growth. Fight Bac. Partnership for Food Safety Education. Foodborne Illness. Centers for Disease Control and Prevention.